For the temporary relief of minor discomfort and protection of irritated areas in sore mouth and sore throat. African Sea Coconut Brand Herbal Mixture is for the temporary relief of minor discomfort and protection of irritated areas in sore mouth and sore throat. Inactive ingredients: Ammonium acetate, Benzoic acid, Caramel, Ipecac, Licorice, Menthol, Drimia maritima bulb, Sodium benzoate, Sucrose, Tolu balsam, Prunus serotina bark. Helps to loosen phlegm (mucus) and thin bronchial secretion to rid the bronchial passageways of bothersome mucus and make coughs more productive. Cough, excessive phlegm, chest congestion, sore throat. ~ Children 6 to 12 years of age: Take 1 to 2 teaspoons (5-10 mL), every 4 hours, not to exceed 12 tsp in 24 hours. ~ Adults and children above 12 years of age: Take 2 to 4 teaspoons (10-20 mL), every 4 hours, not to exceed 24 tsp in 24 hours. ~ Do not use more than as directed. Ask a doctor before use if you have a cough that lasts or is chronic such as occurs with smoking, asthma, chronic bronchitis or emphysema, or a cough that occurs with too much phlegm (mucus). Stop use and ask doctor if cough lasts more than 7 days, comes back, or occurs with fever, rash or persistent headaches. A persistent cough may be a sign of a serious condition. Ask a health professional before use if you are pregnant or breast-feeding. Do not use more than as directed. Keep this and all drugs out of the reach of children. 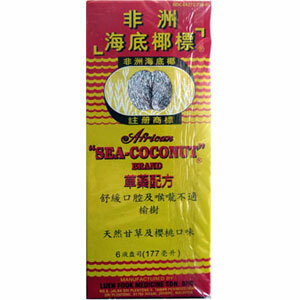 Be the first to review “African Sea Coconut Brand Herbal Mixture” Click here to cancel reply.